The next time you'll see the Knapps, they'll be sporting their little gold medals. Bye bye little sweetie pies. Let us hear from you often! Sylvie is a stunner. She just gets more and more beautiful. I know she will miss you, Laurie! Those are some seriously beautiful kitties and Sylvie's eyes are just gorgeous - they have earned their gold medals and I am sure their new home will be wonderful. Awww....I'm seriously going to miss those sweet little faces. I assume they're going together, no? Farewell sweet ones. 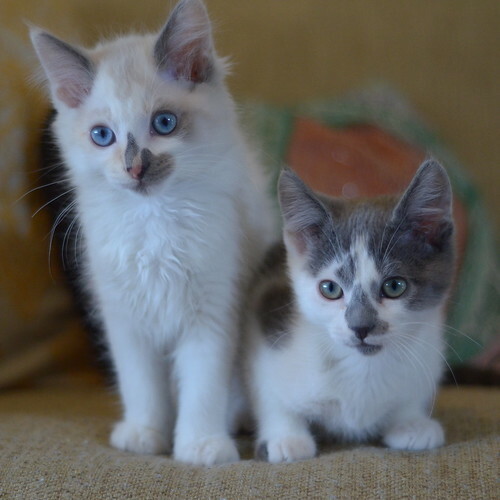 We'll miss you--I hope you two are going to your forever home together. They are the darlingest kittens ever! So much so that I just made up a word. I hope they are going together-they make such a cute pair! I agree, I hope they will be living with the same family...they are both so striking! La la la la la la ... I can't heeeear you!! Awww. But it's time. They're getting big. I will miss the Knapps. They rank as one of my favorite litters, along with the Dearborns and the Medleys. Sylvie is an absolute doll and if I lived in Seattle I would adopt her.